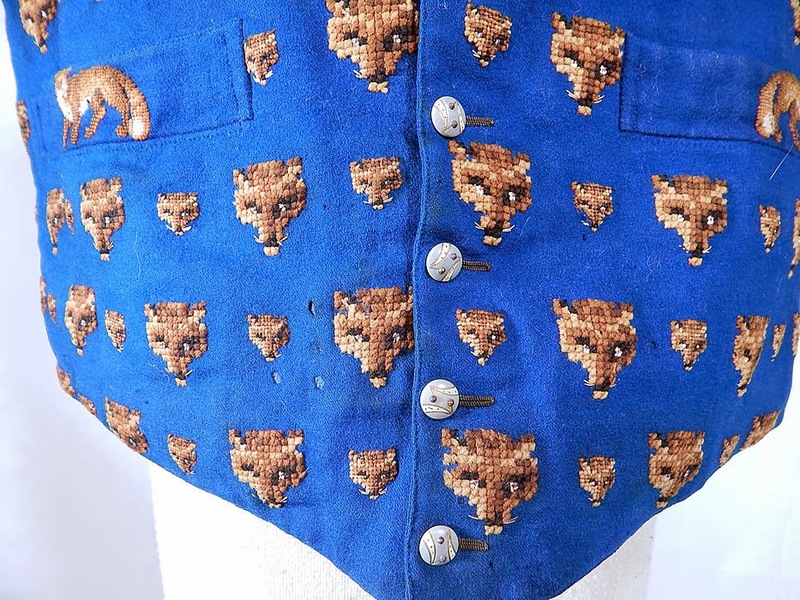 This antique Victorian era gentleman's blue wool needlepoint embroidered fox hunting waistcoat vest dates from the 1850s. 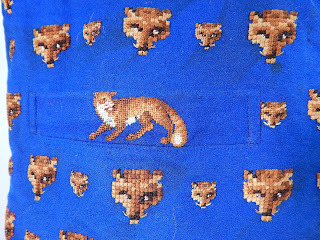 It is hand stitched, made of a bright royal blue color fine wool fabric, with needlepoint embroidered reddish brown foxes and fox heads covering the front. 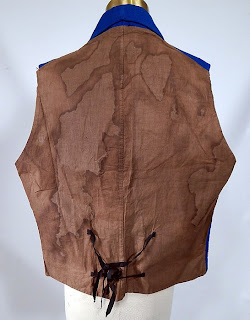 There is a brown polished cotton fabric backing, with two adjustable lacing black tie straps on back. 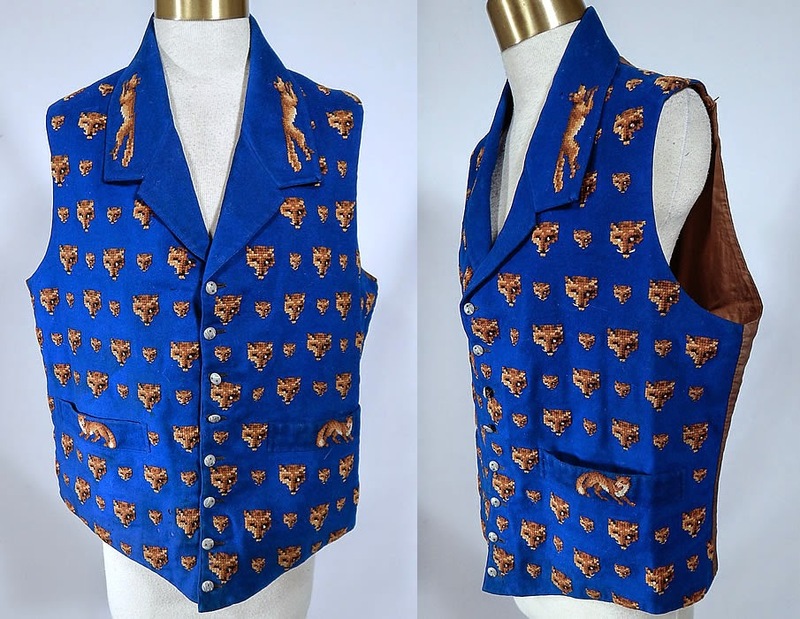 This dapper gentleman's fox hunting waistcoat vest has a fold over lapel collar with a full figure fox embroidered onto it and the two bottom slit pockets, there are decorative etched mother of pearl steel cut buttons for closure down the front and is fully lined. The vest measures 21 inches long, with a 38 inch waist and 40 inch chest. It is in good condition, with some water spotting stains on the back and a few tiny moth nip holes on the front (see close-ups). This is truly a rare and wonderful piece of wearable antique Victoriana fox hunting needlework textile art! The Pragmatic Costumer already has an excellent post on waistcoats during the 1840's and 1850's so I won't repeat the information here. However, based on the shape and styling, I believe this is from the 1840's. Wow! 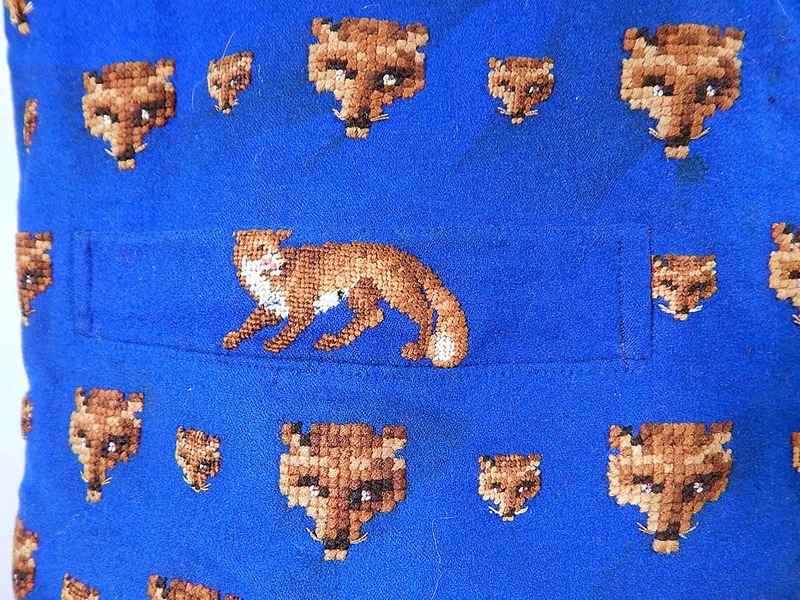 Embroidered foxes on an electric blue waistcoat seems so...21st century hipster! 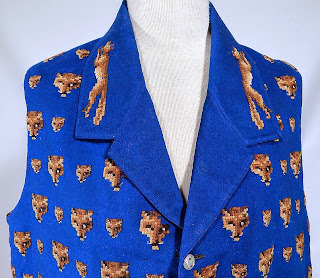 This take "fashion works in cycles" to a whole other level! Lol! I asked my brother who is in his mid 20's if he'd wear something like this and he told me he would. So, I have it on good hipster authority that yes, this is very hipsteresque.